With the launch of VMware vSAN 6.5—the newest storage solution for hyper-converged infrastructure (HCI)—VMware solutions are all set to take center stage in the digital market for days to come. As the industry plows ahead toward 2017, several technological forces are gaining grounds in the VMware landscape. To begin with, the upcoming era will be a turning point for enterprise mobility to break through with the mélange of creativity, perspective, and the use of artificial intelligence (AI). Meanwhile, the amalgamation of virtualization and mobility is shaping the face of next-gen workspace; a relevant example being the VMware Workspace One application that provides users with the quintessential end-user computing (EUC) solution. When it comes to server deployment, VMware has progressed far beyond relying on graphical user interface (GUI). The introduction of PowerCLI has made it easier and quicker to build servers in vSphere—VMware’s centralized operations management platform. In tandem, creating virtual machines is no more burdensome, thanks to the New-VM cmdlet incorporated within VMware’s PowerCLI. Significantly enough, virtualization shares a symbiotic relationship with IoT. While IoT renders virtualization a focused reason to survive, the latter provides the flexible network layout that determines the successful evolution of IoT. However, the evolution of IoT brings along the risk of security. A technology that holds the potential to defend IoT systems in future is blockchain, comprising an entourage of innovative fraud-proof, crowd-sourced, and open trusted mechanisms. The market today abounds in a bevy of VMware solution providers armed with state-of-the-art technologies that can help companies gain proactive ideas to tackle possible challenges. A distinguished panel comprising CEOs, CIOs, VCs, industry analysts and CIOReview’s editorial board has reviewed the foremost VMware solution providers and shortlisted the ones that are at the vanguard fulfilling the urgent demands of the industry. 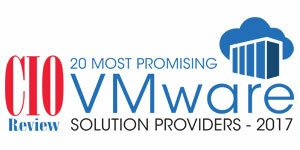 We present to you CIOReview’s 20 Most Promising VMware Solution Providers 2017.
ne Digital Creators of Hybrid Cloud Express for VMware with NSX on the IBM Cloud. The SDDC for SMBs.